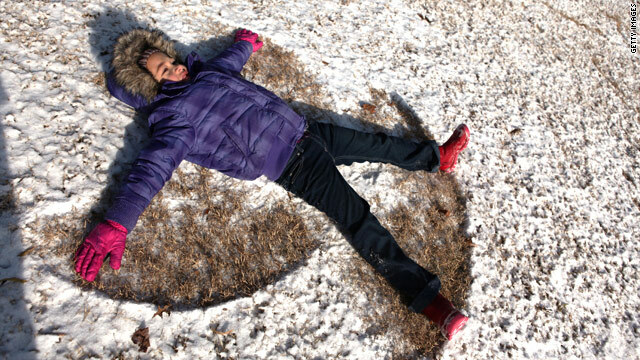 Ariana Ingle, 6, makes a snow angel in a dusting of white Friday at Piedmont Park in Atlanta, Georgia. (CNN) -- Much of the country has turned up the heat during the deep freeze this week, but for some, the icy chill is on its way out. The Deep South joined most of the rest of the nation with sub-zero temperatures Friday as a fast-moving cold front knifed its way down to Florida. Combined with moisture from the Gulf of Mexico, the frigid air dumped a dangerous mix of ice and snow throughout the Southeast Thursday night and Friday morning, coating roadways with a slick glaze. At least nine deaths around the country were blamed on this week's round of winter weather. Relief is in sight for the Midwest this weekend, however, as higher temperatures make their way eastward, according to CNN meteorologist Chad Meyers. But the cold will tighten its grip before warmer air takes hold. An Arctic air mass over the Plains will cause severe wind chills through Saturday morning, the National Weather Service reported. The weather service has issued wind chill advisories for northwestern Missouri, northeastern Kansas, eastern Nebraska and southwestern Iowa, meaning the wind chill could be severe enough to cause frost bite or hypothermia. The South will also experience higher temperatures by the end of the weekend but that region, too, will shiver a while longer. Floridians braced for a second surge of Arctic air that promised to dip well into the southern parts of the state. Key West already set a record low temperature on Thursday, bottoming out at 47 degrees -- shattering the previous low set back in 1897. Temperatures on Sunday and Monday are expected to be in the low-to-mid-40s. The citrus growing regions in Florida and Texas will have to keep an eye on their crops as the cold air remains in the area, Meyers said. In southern Texas, the National Weather Service has issued a hard freeze warning through late Saturday morning, saying that the conditions "will kill temperature-sensitive vegetation and could cause widespread damage or destruction to crops." While forecasts don't predict snow east of the Rocky Mountains in the coming days, Meyers said, a storm system in the far west could drop as much as 10 feet over the Canadian site of the 2010 Winter Olympics. Flakes are expected Saturday and may fall in the coming days on a swath of land ranging from British Columbia to the northern Sierras of California, Meyers said. Vancouver, British Columbia, hosts the 2010 Games, which begin with the opening ceremony on February 12. Alpine skiing begins the following day. CNN's Dave Alsup, Hank Bishop and Sean Morris contributed to this report.